Get away from it all with a peaceful North Myrtle Beach vacation at the tranquil Ocean Keyes North Myrtle Beach resort. Set back from the oceanfront just a couple blocks, this sprawling North Myrtle Beach resort community features six swimming pools, tennis courts and lakefront views. The entrance to this beautiful North Myrtle Beach resort is just two blocks from the white sandy beaches. Pass between a couple of ponds and follow the winding streets to your North Myrtle Beach vacation rental at this gorgeous resort community. Comprised of dozens of three-story buildings filled with North Myrtle Beach condominiums, Ocean Keyes is a unique setting with beautiful North Myrtle Beach rentals. Relax in one of these North Myrtle Beach vacation rentals so you will be rejuvenated for all the North Myrtle Beach area fun that awaits your family. These condos in North Myrtle Beach, South Carolina are in the Ocean Drive section of town. Just one block over from Main Street, your family can walk to get something to eat, shop some of the Main Street stores and listen to beach music at the nearby beach clubs. Why not take some shag dance lessons while you enjoy a North Myrtle Beach vacation at Ocean Keyes? 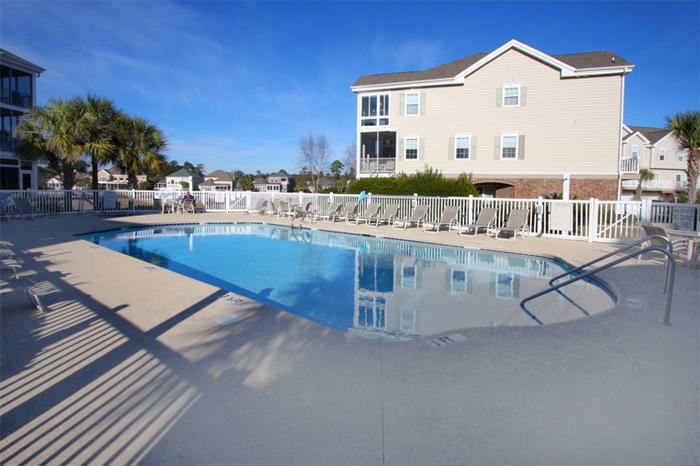 There is a wide selection of North Myrtle Beach condominiums at Ocean Keyes. They are all either two- or three-bedroom North Myrtle Beach rentals. Each of these North Myrtle Beach condominiums have two baths, a convenient feature when these North Myrtle Beach rentals can accommodate anywhere from six to nine people. The amenities found throughout most of these North Myrtle Beach vacation rentals definitely go a long way in making your North Myrtle Beach vacation one to remember. Most of these condos in North Myrtle Beach, South Carolina have Internet access. They all feature a well equipped kitchen that boasts full-size appliances, including a dishwasher. Multiple televisions and at least one DVD player are part of the experience at Ocean Keyes in North Myrtle Beach, South Carolina. These North Myrtle Beach condos at Ocean Keyes also come with a private washing machine and clothes dryer, a real plus if you have an active family that plays hard and gets dirty. These non-smoking North Myrtle Beach condo rentals all have a screened balcony off of the living room. Spend all hours of the day and night outside on the balcony and worry not about any bugs. Just feel the breezes and listen to the sounds of nature on these private balconies. All of the balconies at this North Myrtle Beach resort are furnished with some sort of table or chairs so you can full relax while you are outside. Elliott Beach Rentals is not affiliated with onsite management or the HOA of Ocean Keyes.